FILE - People cast their ballots in Carson City, Nevada, Nov. 4, 2014. The path from the State Department to the White House is less well trod than it once was. While it was common in the early days of the American Republic for a secretary of state to become president — in all, six made the transition — that tradition ended midway through the 19th century. Back then, the young nation was little involved in international affairs, and its chief diplomat's job encompassed mostly domestic responsibilities — including oversight of the patent office. "On the whole, the secretary of state didn't have that much actually to do," said Anders Stephanson, a professor of American history at Columbia University. 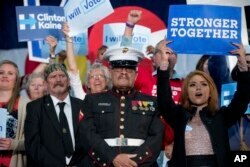 A member of the military stands in the audience as Democratic presidential candidate Hillary Clinton speaks at a rally at the Colorado State Fairgrounds in Pueblo, Colorado, Oct. 12, 2016. Nor did foreign policy always help them in the White House. James Buchanan, the last secretary of state to be elected president, was blamed for allowing the country to drift toward its ruinous Civil War while John Quincy Adams, regarded by many historians as the greatest secretary of state in American history, saw his presidential agenda blocked by a hostile Congress. Over the past two centuries, only a handful of presidents has had experience in foreign affairs before being elected. "This is because American politics is overwhelmingly domestically oriented," said H. W. Brands, a professor of history at the University of Texas at Austin, who listed only John Quincy Adams, Theodore Roosevelt and Richard Nixon in that category. Stephanson added Woodrow Wilson, Franklin D. Roosevelt and John F. Kennedy to the list, though none served as a secretary of state. But even as the department of state has grown from "six guys and six pencils and six desks" as Stephanson put it, into a diplomatic behemoth headed by a globe-trotting trouble shooter, it has not elevated the importance of foreign policy in U.S. national politics. So indifferent to foreign policy are American voters that "when a president was elected with foreign policy experience, it was usually less about his foreign policy experience than other things," Brands said, citing Nixon's 1968 election as an example. 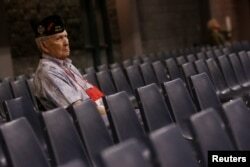 FILE - A veteran watches as U.S. Republican presidential nominee Donald Trump speaks to the Veterans of Foreign Wars conference at a campaign event in Charlotte, North Carolina, July 26, 2016. Americans are far more likely to elect a senator or governor than a former secretary of state. A 2015 Pew study of 131 presidential nominees showed that by far the most common highest prior offices held by those candidates (other than sitting or former presidents) were governor and senator. That trend has continued in recent years. President Barack Obama served as a U.S. senator before he was elected. George W. Bush and Bill Clinton were both state governors. Democratic presidential candidate Hillary Clinton was a senator from New York before being appointed as secretary of state. "In recent years, voters have looked for executive experience, candidates that have been governors and senators," said Mike Purdy, who runs the popular history website presidentialhistory.com. "I think the power has shifted from an appointive secretary of state position to Americans looking for elective office in terms of senators or governors." Most American voters go to the polls with domestic concerns in mind and "if you can satisfy them in those regards, you can get elected," Brands said. Former president George H. W. Bush, considered a foreign policy stalwart, lost a 1992 reelection bid amid deep voter dissatisfaction about the state of the economy. FILE - Then-Russian President Boris Yeltsin toasting with then-U. S. President George H. W. Bush after they signed the START II treaty in Moscow, Jan. 3, 1993. Bush's defeat popularized a campaign refrain that has proved resonant in recent elections: "It's the economy, stupid." "It taught American candidates for president, at least the ones that were paying any attention, 'Don't count on foreign policy doing you any good,'" Brands said. With global crises proliferating, are voters taking foreign policy experience more seriously? As in recent elections, the economy remains the dominant issue for most voters, but they seem to be paying greater attention to foreign affairs. In a July Pew Research Center survey, 84 percent of registered voters said the issue of the economy will be very important to them, while 80 percent said terrorism will be very important, and 75 percent called the issue of foreign policy very important. Republican presidential candidate Donald Trump speaks at a rally in Waukesha, Wisconsin, Sept. 28, 2016. In the same survey, backers of Republican presidential candidate Donald Trump appeared to take foreign policy more seriously than Clinton’s fans. 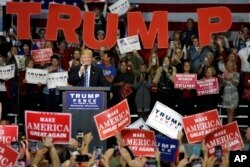 Seventy-nine percent of Trump supporters and 73 percent of Clinton supporters said it was very important to their vote. Clinton can tout her foreign policy acumen, but rival Trump has used her four years as secretary of state as a punching bag. During the first presidential debate last month, Trump said, "Hillary has experience, but it's bad experience." Stephanson said Clinton was less "brilliant" as a secretary of state than as a senator. "But that's neither here nor there," he said. "For those who think that foreign relations matter, yes, it is a definite plus, but it's not going to make her or break her." 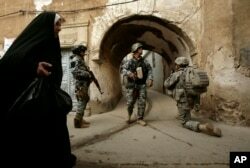 FILE - An Iraqi woman passes U.S. troops and Iraqi police officers as they stand guard in the Bab al-Jadeed area of Mosul, 360 kilometers (225 miles) northwest of Baghdad, Iraq. In times of war, public interest in foreign affairs rises. However, on the only global threat voters care about — terrorism — they see little difference between the two parties or their candidates, Brands said. "Neither party has been able to gain a lot of traction against the other party by saying, ‘You're soft on terrorists,’” Brands said. If Clinton is elected president, she'd become the seventh former secretary of state to enter the White House, but she may not easily hand over the diplomatic reins to a new head of the State Department. "Strong presidents with strong interest in foreign relations could have competent secretaries and even strong ones, but ... usually as advisers and close associates," Stephanson said, citing James Baker, secretary of state in the elder Bush's cabinet, as an example. Should Retired Military Officers Endorse Presidential Candidates?